It has been awhile since the Florida Panthers have won a game at the Verizon Center. The Washington Capitals have won the last five games at the phone booth and have had 3 of the last four games end with a Caps' shutout. Tonight would prove to be a tough game for the visiting Panthers as the Caps romp Florida 5-0. Coming into tonight's game, the Capitals were committed to focusing on what is ahead of them. With a hard practice on Friday, they were looking to be in the right frame of mind for sixty minutes against Florida. The players even held a meeting to get things back on track. "We had a team meeting with the guys just to press the reset button and to calm down and go out there and support each other and make plays," Joel Ward said. "Today we made a good effort." "I had a feeling right away that we were going to play well," Alex Ovechkin said of the mood of the team before the game. "Everybody was focusing and not joking around. That’s how we have to play. The first goal was huge for us. The whole team was better." Braden Holtby has now four career shutouts and also a assist, only the second of his career. His power play assist led to a big goal for the Capitals to exorcise the demons they have been fighting in second periods this season. "It was a great play, and a big goal," head coach Adam Oates said of the play. "It obviously hurt that [the Penguins] had scored one of those against us. It’s a pass down the ice; that means [Holtby] is involved in the game." Troy Brouwer had a big night with the first two goals of the game. The first one looked as if John Carlson scored his first goal of the season, but his shot glanced off Brouwer's leg before fooling Jose Theodore. Brouwer's second goal was a sniper blast after receiving a pass from Holtby on the power play. He skated down the right side and powered it past the Florida net minder. It would be Brouwers fourth and fifth goals of the season. Also on the scoresheet, Ward scored for his fifth goal of the season. The aggressive forecheck of his linemates Eric Fehr and Matty Perreault coughed the puck up to Ward's stick as he headed for the net. He snapped it past Theodore to make it 3-0. Ovechkin scored his first even strength goal of the season after Ribeiro won the faceoff and Jason Chimera chipped it to Ovi at the top of the slot. Add a Perreault goal to give the Verizon Center faithful free wings, and the Capitals finish off their best performance under Adam Oates to date. This was a good sixty minute effort from a struggling squad that needed a desperate win to stop a three game skid. Their play was much better after the first period. The second period, which has been a house of horrors for this Capitals squad, was not the disaster in waiting much like it has been for the Caps of late. For the first time all season, the Capitals have actually outscored their opponent in the second frame. Special teams was a hot button issue for general manager George McPhee. Concerned over the Caps taking a few too many penalties, he could find some comfort as the Caps were a perfect 2-2 on the penalty kill and a 1-2 on the power play. It was a good sign the PK is improving especially against a good power play team in the Panthers who are ranked 11th in the league. Holtby was pretty solid. He was controlling rebounds and making smart decisions with the puck. His pass to Troy Brouwer to catch the Panthers on a line change while on the power play led to the game's second goal. The goal was huge for the Capitals as they stretched their lead to two goals and forced the Panthers to play a more conservative style of hockey for fear of giving the Caps another power play. "The traffic in front of the net tonight was non-existent today," said Holtby to reporters following the game. "Our defense and our forwards really took it to heart this last little while that we need to bear down on our end and it was outstanding tonight. We’re going to need that to keep moving forward." The Capitals will get a much needed day off to rest then back at the rink on Monday before they head to the Sunshine state for a second rendezvous with the Panthers in Sunrise Florida. This is definitely a game the Capitals can grow off of. As long as their work ethic can continue, the Caps certainly have the time to crawl back into playoff contention. 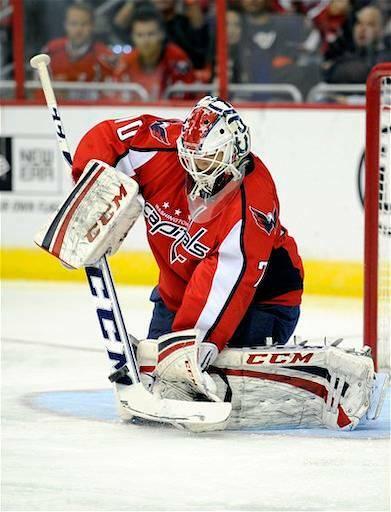 Holtby was named the game's first star followed by Brouwer (second star) and Ward (third star). Ovechkin continues his point streak to now 4 games with 2 goals and 3 assists during that span. Perreault scored his first points of the season with a goal and an assist. He has been in and out of the lineup sharing duties with Marcus Johansson. Perreault did not play against Pittsburgh on Thursday night. The promotional double whammy, Caps scored 5 goals and won which means the 18,506 in attendance won free wings and everyone in the DC Metro region gets Papa John's Pizza half off tomorrow (by using promotion code CAPS50).